Its a common issue for we guys at college in our part of the world to see our Youtube video streaming at a very slow speed. Youtube, no doubt, is an excellent platform but a slow connection hampers the experience by a great deal. Its frustating to wait for the video to buffer. The Youtube page contains a lot of information such as similar videos, comments, likes plus a few thing relating to privacy, safety, bug report etc at the bottom. Thumbs up for that for I love having options at hand. But then, I sometimes wonder- "Are we the only people with a slow connection ?". Wont it be nice in such a case to limit some of the youtube features to get the video buffered better ? After all, its the video which one tunes into Youtube for, others just play a supporting role. I , for sure, maintain that, for these features are of no value to me if I cant get the feel of a video and I expect Google to understand that and give me some control over this issue. I am a big Google fan and always expect their products to be of excellent quality with a lot of power to the users. But then do I have an option here ? Yes, I do !! 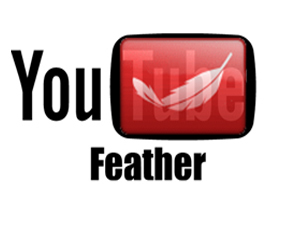 I was just going through web trying this afternoon and came across something called Youtube Feather. Have you heard of it ? If not, spare a minute. Give it a try. You can try it out here. If you want to know more, you can also look at a 1 minute video of it at youtube itself. But then, what goes on at the back is just what I mentioned earlier. Its a trade-off between the speed at which your video loads and the features you want. Youtube feather limits the video suggestions to 5 as opposed to 21 normally and the number of loaded comments to 10. The video is of standard quality (no option to upgrade to High quality exists). In addition to these, Video replies, real-time sharing, and auto-suggest from YouTube's search bar have also been cut down. And the biggest trouble I think is that it cant play all the videos. Though I have not found such a video yet, I have read the same. Probably, that is the reason its not very popular as of now, but then as always I am excited about this feature from Google. Take a tour of the Google blog though if you want to have a look at the figures on how effective is it after all.